This was work I made using a decaying caravan in the two and half acres that we called our little wind-battered paradise in West Cornwall. I have retrospectively called it, 'Sum of the parts'. It was an attempt to make something installation-like. To be honest I didn't know what 'was going on here then' even though I had made the so-called piece. Looked at through his eyes with all my self-doubt and self-criticism added in it just looked like an amalgam of conveniently close-by items. Maybe it still does. I quickly dismantled the piece later in disgust with myself. I am glad I at least took some photos. With distance I seem to be able to see more, or at least something that means something to me. Before that I should say that I've always struggled between the literal and the enigmatic in my art. I have a strong empirical/analytical bent. I've also struggled with the spectrum between the expressive/emotional and the intellectual/rational. In this piece I think I was trying to create something enigmatic that didn't give up a single meaning or message. 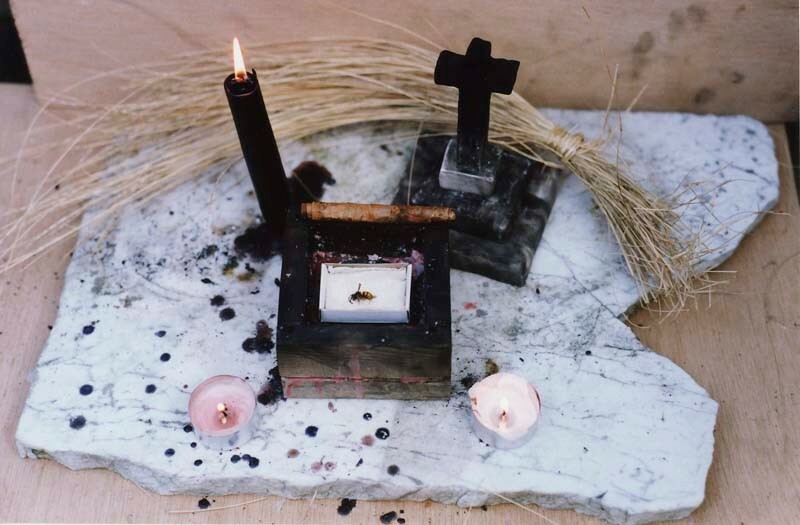 I've always liked Joseph Beuys but I've never come near his sense of confident self-absorption and ability to exist in a series of apparently parallel but linked universes. Anyway, here is now what I see in the piece. It seems to represent a kind of memorial to my father, who had died terribly of esophageal cancer. 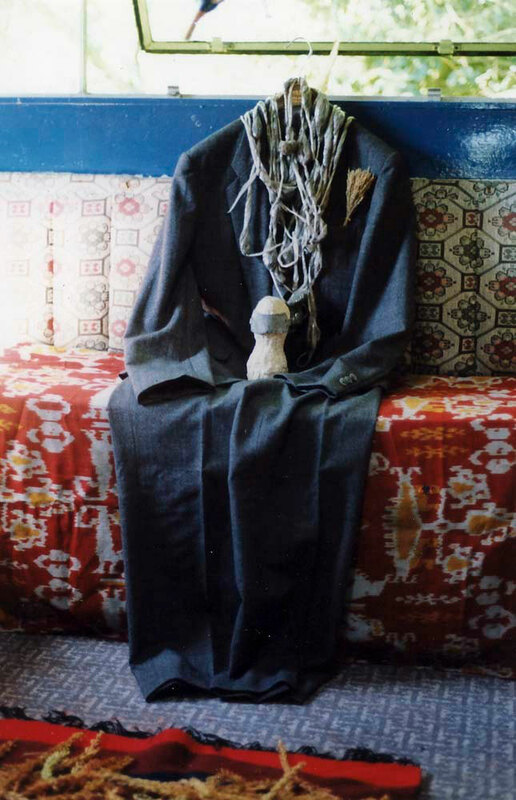 The suit is his, tailor-made in Hong Kong. 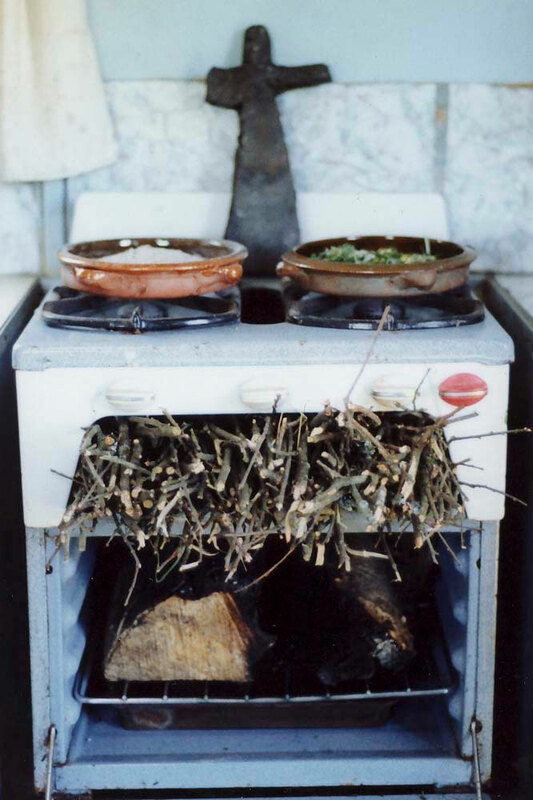 The cooker and its sort of preparation to cook food with an unlit fire and the wheat ears on the floor (that I had grown in my garden) now feels like a child's feeble attempts to look after a parent, to try to provide for them. Or to reverse the finality of death. 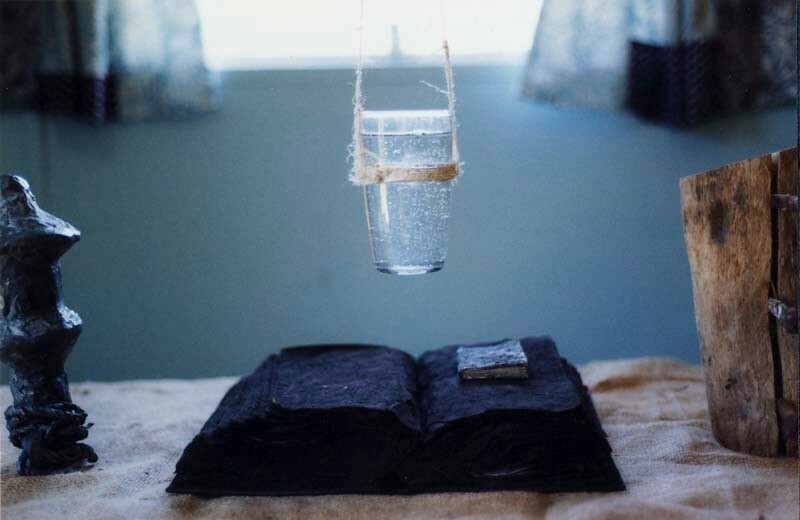 The book with the suspended glass of water looks like a tense situation; looks like something terrible that is going to happen to some special hallowed object. The clumsy anxious child wanting to impress Dad and just making him mad. The black book, its words obliterated and silenced. And all of it in a decaying caravan on a windswept hill in Cornwall. A place out of the wind and rain, rarely visited, in fact, intensely private. Outside a stream flowed past under the canopy of a wind-stunted ash tree. I'm now reminded of the tombs I visited in Cyprus. 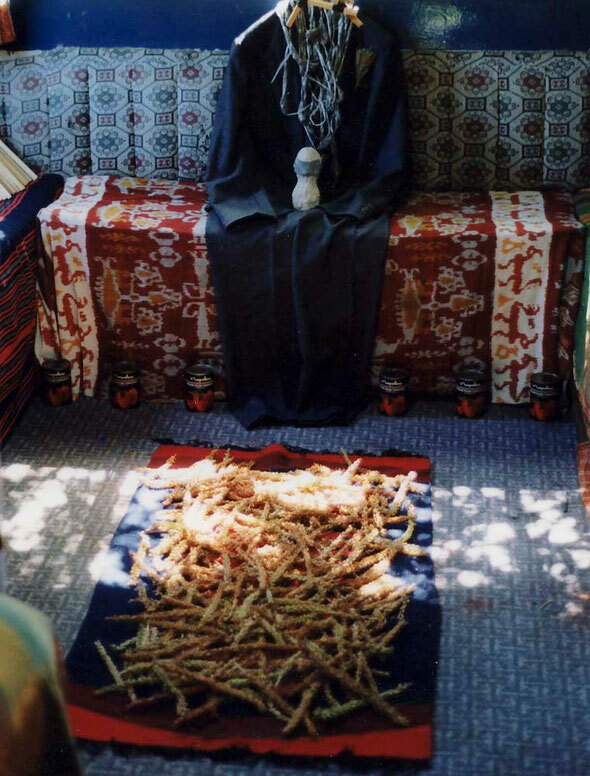 The ears of wheat, the firewood, clothes, book - all nourishment for the spirit in the afterlife. I don't think any of this was 'meant' when I made the piece although it always had a sense of intense memorial stillness. But maybe I should add a sub-title to the 'Sum of the Parts' - 'Mixed Memorial Message to Dad'. Or call it 'Sum/Son of the Parts'. 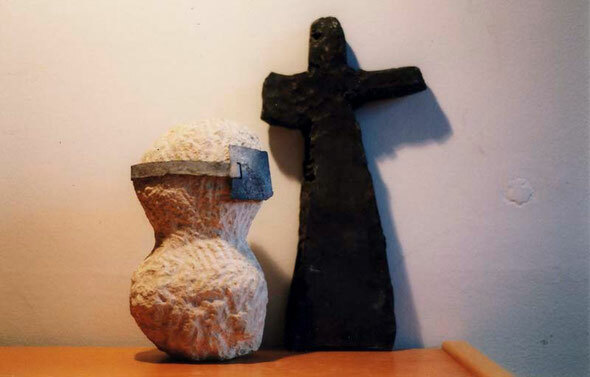 In this reading the 'Sum of the Parts' refers both to the artist - formed from the raw material of the 'parts' - his parents and to the way in which the piece is an amalgam of different things I had previously made/grown in the studio/garden and found. I wrote a trilogy of poems about my dad after he died, aged 60. Here is one of them that seems to fit in with the mood of 'Sum of the Parts'. To me it is strange that I conceived of these two expressions of tangled grief and remembrance independent of each other and that it is only now, 15 years on, that I have made the connection. in the late September sun. The wind already chill on your dressing gown. on your half eaten sinking ship. doing the bleak hospital grounds clumsy in my grip. that little last comfort from you. taken when I was two. you’d etch yourself upon the film. your big fingers digging into my small chest. and then left me with you. I have shied away from the autobiographical in my 'art', although the opposite is true of the poems and songs I have occasionally written. I'm not sure why. Perhaps because I needed some distance from myself or because I didn't seem an important enough subject about which to make 'art'. I remember getting really pissed off when researching Louise Bourgeois' work and her milking of her own autobiographical trauma as if her life (art?) depended on it. It was interesting and engaging to start with but enough already. Maybe once self-professed autobiographical artists become famous their autobiographies become less interesting. And there are only so many times you can revisit early trauma before it becomes a pastiche of itself?